We're sorry, this page is under construction. The complete information will be available soon. 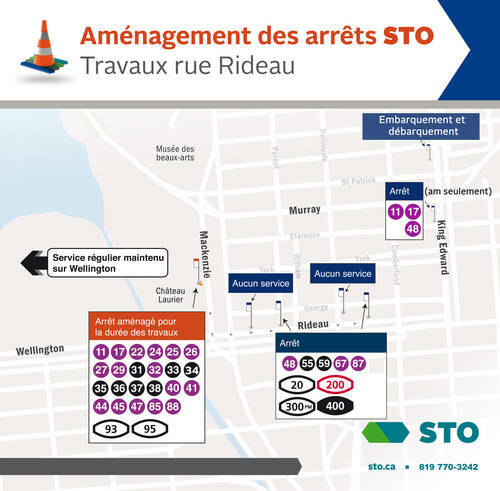 Due to the construction work related to the light rail project and to traffic restrictions on Rideau in Ottawa, STO bus services have been reconfigured through Ottawa's downtown. On October 19, Rideau was completely closed to allow construction work to continue. Rideau is now once again open to traffic, and our service will resume, but with the same reconfiguration that was proposed before the complete closure. There is still a major stop on Mackenzie (next to Château Laurier) to keep the bus service running smoothly. Routes 11, 17, 22, 24, 25, 26, 27, 29, 31, 32, 33, 34 35, 36, 37, 38, 40, 41, 44, 45, 47, 85, 88, 93 and 95 leave from Ottawa on Mackenzie and then run along Wellington to serve the regular stops. Routes 20, 48, 55, 59, 67, 87, 200 and 400 heading to Gatineau are once again serving the stops along Rideau. This stop will not be served until further notice. Go to the OC Transpo bus stop in front of the McDonald's on Rideau. Based on tests done by our operations crews, the stop on Wellington at the corner of Bank heading to Gatineau has been moved to the first bus shelter in order to make it easier and more efficient for passengers to board. Only the first two buses at the stop will open their doors for boarding. If you see your bus, kindly proceed to the first bus shelter to board. Once the first two buses have finished boarding and left, the third and fourth buses will pull up to the first shelter and then open their doors for boarding. And so on. All passengers are asked to follow these instructions to ensure that the new procedure works to everyone's satisfaction! Routes 31 and 32 no longer serve Murray, nor do they cross the Alexandra Bridge. Routes coming from Aylmer no longer serve the Dalhousie/Rideau stop, which has been replaced by the Rideau Centre and Rideau/Waller stops. See the transit map with the reconfigured bus stops during the construction work on Rideau. Know more before you go! Check the System-Info alerts posted on our STO's home page. To receive these alerts directly by e-mail or text message, just log in to your My Profile account or create an account easily now.